The book by Joseph Rothstein has been for a long time an important reference for those involved in computer music and interested in learning or improve features of MIDI technology. Although it is rather dated (the first edition was in 1992, followed by a second edition in 1995), which is not irrelevant in the context of technology, it is true that Rothstein’s book is still very useful, since the MIDI in its basic characteristics was not affected by significant changes from the first version of the early eighties. Over the years has changed the hardware controller. Similarly changed the software that integrates MIDI technology. But the communication protocol has remained more or less unchanged, thanks to the fact that MIDI, over the decades, has emerged as a standard for computer music composition and performance. 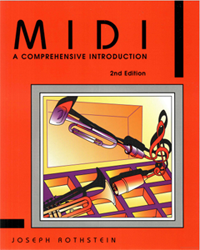 Rothstein’s book, it should be emphasized, is not only a handbook that deals with features of the MIDI protocol; the author, in fact, also discusses more general issues relating to computer music. For this reason, after the first chapter of an introductory nature with a brief historical reference to MIDI development, Rothstein focuses on more general issues such as acoustics (Chapter 2) and some of the basics of computer music (Chapter 3). In this way, readers that not have the basics, have the opportunity to learn about some fundamental issues such as physical characteristics of a sound or the differences between sound and noise, the sampling of sound signals or the differences between analog and digital representation of sound. In the following pages we find an overview of the different controllers able to interface and work through the MIDI protocol (Chapter 4), or about the different types of software (Chapter 5) with particular attention to the sequencer (Chapter 6). Although both hardware and software have greatly affected by the changed technological situation, the topics addressed by Rothstein follow a fairly general approach, for this reason they are still current. The music applications of a sequencer have remained unchanged over the years, the same way a bank of sliders. The seventh chapter is related to configuration issues between MIDI protocol, the computer and any controller; while the later chapters are devoted to a more detailed explanation of the features of MIDI messages (Chapter 8) and synchronization (Chapter 9). The tenth chapter focuses on programming issues. In fact, from another point of view, MIDI is a computer language where a series of specifications determine the communication protocol. The book ends with a chapter that, more than the others, suffers for the date of the book: a guide to the different tools available in those years and now are no longer very current. In the appendix, finally, we find the summary tables of the MIDI protocol specification.